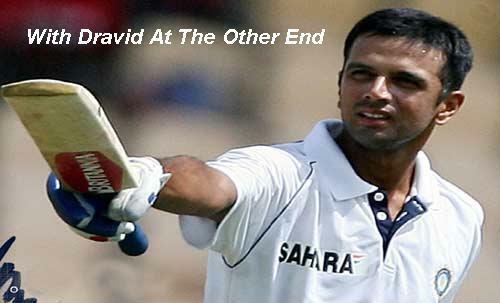 No Indian batsman will have Rahul Dravid as his batting partner at the other end any more. The nice guy who finished almost first, Rahul Dravid is truly one of the all time greats to have played the game. His traditional cricket records are astounding – 13200+ runs at an average of 53 odd – ahead of everyone except Sachin Tendulkar, 36 Test hundreds, 210 Test catches, and for someone thought to be unfit for ODIs, he still is the 7th highest rungetter in ODIs with over 10000 runs and 83 fifties. Predictably, he also holds the record for facing the highest number of deliveries by a Test Batsman over his career – some 31000+ balls. Perhaps that is the ultimate record for a man who seemed to be always there at the other end for the team. Individual performance statistics on their own obviously demand that history will look at him as one of the all time greats. But more important than that was the irreplaceable, intangible value that Dravid held for the Indian team. Like salt in every great dish, Dravid’s contribution in India’s great performances has been essential and vital, but missed only when it is absent. The taste of the dish has always been attributed to the spice and the other ingredients. When Sachin scored his previous highest ODI score of 186, he was involved in a 331 run stand with Dravid. When Sourav scored his highest ODI score of 183, he was involved in a 318 run stand with Dravid. When Laxman scored his highest Test score of 281, he had a 376 run partnership with Dravid. When Sehwag scored his triple centuries – both in Pakistan and South Africa – he shared 410 run and 268 run partnerships with Dravid. Again when Sehwag scored 293, Dravid was at the other end in a 237 run partnership. In the eight 300+ partnerships in Tests and ODIs since 1999 by Indian batsmen, Dravid has been involved in five. Overall, he has been part of 88 century stands, 19 with Sachin (a record), 12 with Laxman, 10 each with Ganguly and Sehwag, and even 7 with Gambhir. Till the last 4 hundreds he scored (3 of which came in losing causes against England in 2011), only one of his first 32 hundreds was in a Test that India lost. His average in India wins is 66+ against overall average of 53 odd. Though often overlooked, Dravid also had partnerships with Kumble and Harbhajan as a fielder. Caught Dravid bowled Kumble accounted for 55 catches, and Caught Dravid bowled Harbhajan accounted for 50 catches, out of his 210 record catches by a non-wicketkeeper. There used to be a joke about the importance of the ‘control sample’ in Market Research, and how one could reach wrong conclusions if one did not employ a control sample to isolate causal factors. It said that a researcher had whiskey with soda, vodka with soda and rum with soda on three separate days, and got inebriated on all three days after a few pegs. Later he published a thesis that it is not the drinks but the soda that causes the intoxication, because that was the only common factor. In that case, the researcher was wrong. But in the case of Rahul Dravid and his partnerships, it is Dravid that has been the underlying, often unsung, factor in the intoxication caused by Indian batsmanship over the past 15 years. He has been the wind beneath the wings, holding ground while others take flight. No other Indian batsman will have the privilege and the luxury of having Dravid at the other end any more. Someone else will have to hold that end now. Take a bow, Rahul Dravid!